A unique Italian ceramic pitcher for your home or an ideal housewarming or wedding gift. Also, makes the perfect juice pitcher to use for breakfast or brunch! We offer the .75 liter size that can hold one full 750ml bottle of wine and we offer the 1.5 liter that can hold two 750 ml bottles of wine. 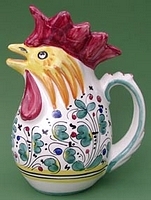 This Italian Rooster Pitcher is famous because it symbolizes good fortune. 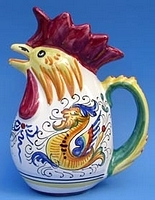 For more information on these rooster pitchers, see "Roosters of Fortune" for the legend of the Rooster Pitcher. 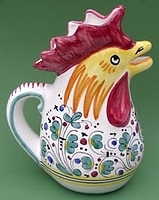 Each ceramic pitcher will come with the legend of the Rooster Pitcher written on a small scroll. All of the patterns on these pitchers compliment other Italian pottery products that we offer throughout our website.